Enjoy an ideal well deserved holiday in this fantastic house. The villa is built in traditional Galician stone style and is fully equipped: the spacious modern kitchen is equipped with all modern appliances and has a dining area; a spacious living room overlooking the garden, terrace and Portugal; 2 double bedrooms, one with an ensuite bathroom) and 2 single bedrooms with a second bathroom. Furthermore, the house is fully equipped with double glazing and central heating, and has sliding glass patio doors to the terrace, sun deck and garden. The villa has spacious beautiful garden with a traditional stone fence and provides safe parking space for two cars. 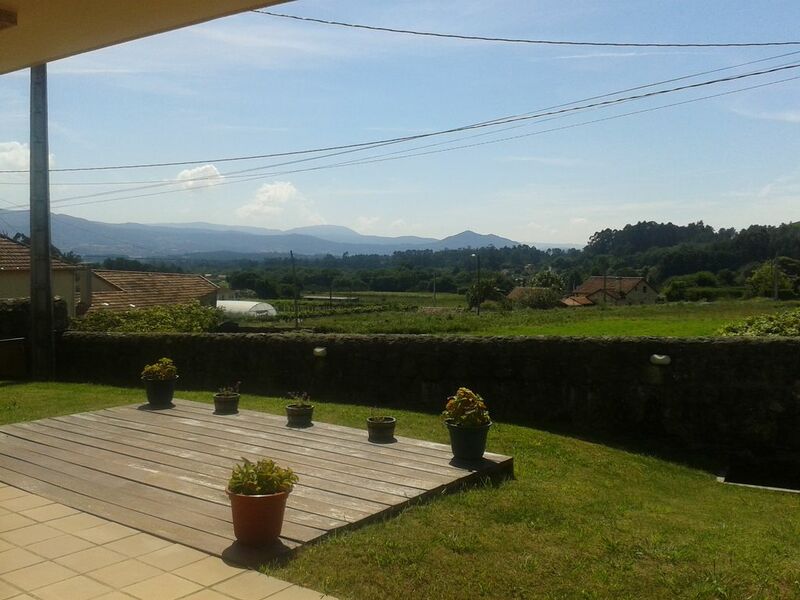 It is located in a quiet, rural area, surrounded by vineyards and with views of Portugal. And it is about 5 minutes away from the lively center of Tomiño, which is well equipped with shops, restaurants and bars. A € 300 deposit will be requested upon arrival. You will receive the full amount on departure if there is no damage to the house and contents. For more information you can view the website. Recomendable 100% Gracias por todo! A short distance from Porto, Santiago de Compostela, Vigo for a city break, Baiona, La Guardia and El Rosal. You can visit the local markets, go to the beach, take the catamaran to the islands of Cies. You can take the wine route. Walking in the area, visiting local festivos. In short, there is something for every visitor to find something that makes your holiday ideal!